Cartogram representation of the Electoral College vote for the 2012 election, with each square representing one electoral vote. Here's one with the population from 2000. As far as the high school graduate issue, it seems to be a mixed bag. Wyoming is totally 80%+, and is a reliably red state. Nebraska and Utah are almost totally 80%+, and they are red as well, none redder than UT. CA, VA, and FL have large areas under 80%, and are blue. It was interesting to me that the Pine Ridge Reservation just north of the Nebraska border has up to a 30% higher HS graduation rate than the deep south. Nebraska is a red state, but we're not an evangelical state--most people here are Catholics or Lutherans. I think that's the real issue in being radically conservative--the evangelical influence. Although we are reliably conservative, we don't have teavangelical R leadership in power, although it will be interesting to see how Deb Fischer operates now that she's in the Senate. We tend to stay away from the crazy social issues and focus on more common sense conservatism--for instance, demanding that the Keystone Pipeline reroute when they planned on running it through the middle of the Ogallala aquifer, despite what the national party said we should do out here. Maybe it's because we're a unicameral (we don't have a House--only 50 state senators who are elected on a nonpartisan basis). People here tend to form alliances based on issues vs. party lines. The standing line on the political system here in the state is that we are reliably conservative, but not reliably republican, and that there's a big difference. Most could care less what the national R party thinks or says. We do our own thing. I understand the objective of what you're getting at...poor, religious, uneducated, simpletons overwhelmingly vote for the GOP seemingly against their own interest. But it isn't overwhelmingly the case...and the political trends change throughout the cycles. 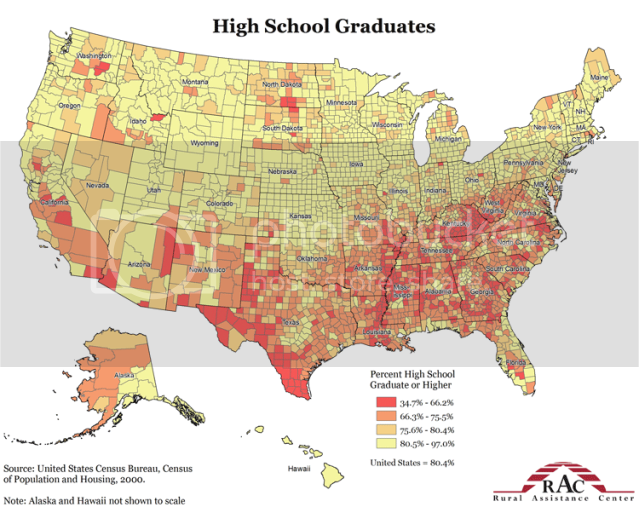 As mentioned in the previous post Wyoming is the only state without one county outside the top tier of high school graduation rates...it isn't remarkably religious...and it is overwhelmingly conservative...probably Libertarian to be most accurate. The obvious area of intrigue is the rural South from West Virginia through the western tip of VA on down to the Gulf. Lets not forget that some of these areas were Clinton strongholds in 1992 and 1996. The same argument you're attempting (I think) to make now could be made then as well. Another area of intrigue would be heavy inner city populations...downtown Philadelphia, downtown Newark, downtown Atlanta, downtown Birmingham, downtown Baltimore, etc....all these areas are overwhelmingly democratic (even the ones in red states) yet have higher religious adherance and lower high school grad rates........does the same synopsis apply to these people? I think you're probably right that conservatism in the Great Plains and the West tends to be more way more libertarian than social conservative, but it's not the Ron Paul version--it's more moderate and common sense. The rancher mentality is live and let live--you leave me alone and I won't bother you. Smaller government is good, but people do expect good schools, etc. I grew up in a ranching family, and there absolutely is support for education, environmental protections, access to health care, etc. The current libertarian party goes too far in the direction of no government for most. Last edited by mb1547; 11-15-2012 at 10:58 AM.. I'd like to point out that most of the counties in Colorado with a lower high school grad rate are very sparsely populated. The exceptions appear to be Denver and Adams; it's hard to tell with the maps being small. I think you're probably right that conservatism in the Great Plains and the West tends to be more way more libertarian than social conservative, but it's not the Ron Paul version--it's more moderate and common sense. The rancher mentality is live and let live--you leave me alone and I won't bother you. Smaller government is good, but people do expect good schools, etc. I grew up in a ranching family, and there absolutely is support for education, environmental protections, education, access to health care, etc. The current libertarian party goes too far in the direction of no government for most. Unfortunately if you espouse a live and let live mentality loudly enough or any brand of states right type issues you are almost always reduced to espousing "racism" by the intellectually weak...especially on this forum. I think civil/individual rights issues should be federal, and standard across the country for all Americans, but beyond that I agree. I was active in the republican party for over 30 years, but I've given up on them now (at least on a national level). I guess I don't feel any loyalty to the party anymore--they left me when they embraced all the crazy stuff--I didn't leave them. I understand that. To be honest when I was watching the GOP primaries I started to find it hard to stomach. It just essentially turns into a broken record with all the candidates trying to compare their love for Jesus and their hatred of the government in the most outlandish way possible. I can still remember the line Bachmann made regarding Rick Perry and HPV vaccinations. "You're not going to give my daughter, our daughters, a government injection!" This of course was met with loud cheers......and me shaking my head. It looks like our counties that have a slightly lower graduation rate are mainly centered around big meatpacking centers. It makes sense, because those are the areas where we have larger rates of "new comer" immigrants working. As far as the rest of the state goes, we're like you guys--counties with less than 100 people in some instances--so a few people in those areas can really throw off the data.